Our challenge was to enhance the mobility sales of Santander's agents around the country. Bank agents are responsible to visit their clients in their offices to track the progress of the companies and present new products that could fit their current needs. For half year, we researched and co-created solutions to consolidate a new mobility sale model. I was part of the project team formed by 1 sociologist, 1 user experience researcher, 1 design strategist (myself) and 1 product manager. My duties were to define the research plan, create the research material, conduct qualitative research with users and client stakeholders, co-lead the generative workshops along the project, synthesize the data gathered on field, uncover key insights and service guidelines and design initial wireframes of the final solution. This project represented a complex transformation that affected to the structures of current processes, protocols and channels of the bank. To execute this transformation it was necessary to use a systemic approach considering all the relevant aspects of the experience. 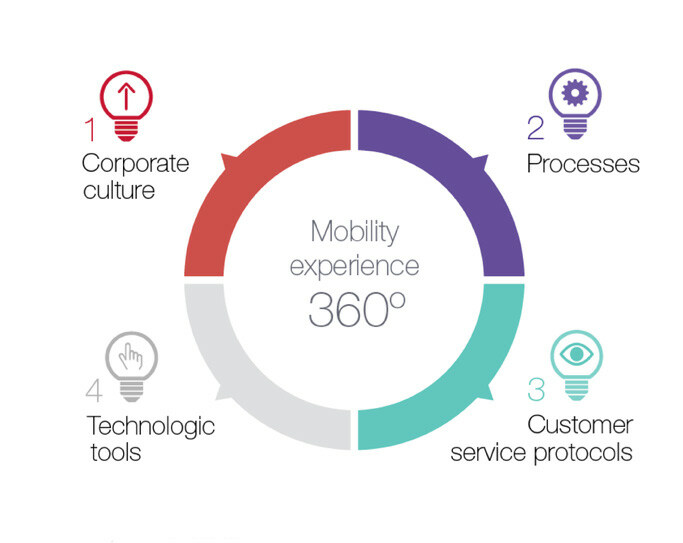 We defined a new experience for mobility services and redesigned the principal touchpoint of the experience, the Advance gestion app for tablets. Aiming to understand the sales process and agents' associated behaviors, we decided to follow agents in their daily routine working at their branch and visiting clients at their companies. Moreover, we organized co-creation sessions with them to prototype the ideal app to solve their most common hustles. 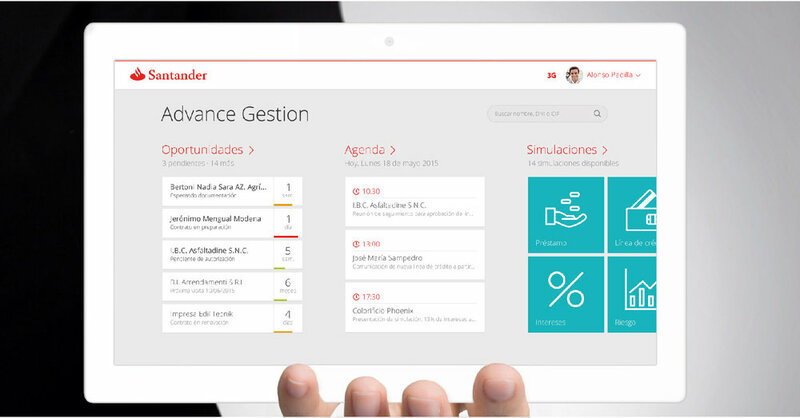 Santander approached its mobility sales problems with a technology driven approach. They bought ipads for the agents and install a standard app that did not solve agents' main pain points. The app was not user friendly and the agents found little value to use it with clients. In adittion, there were several types of employees with differentiated digital technologies learning curves which resulted in different adoption levels within the sales force. Agents felt scared to show confidencial data to clients (client value for the bank, global positioning...) therefore the interaction with the tablet was not comfortable. Most agents prefer to print information to visit the clients. 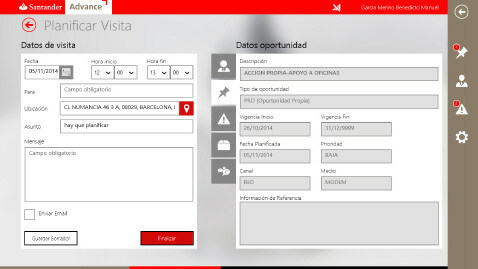 Technical problems with Advance gestion app exposed the agents to lack information in the recommendation process of new products during the visits. Some of the features of the app were not useful in the interaction with clients, however they were placed in the main navigation of the app. Agents hacked the system to satisfy mobility sales objectives. They scheduled ghost visits to achieve their minimum results required. 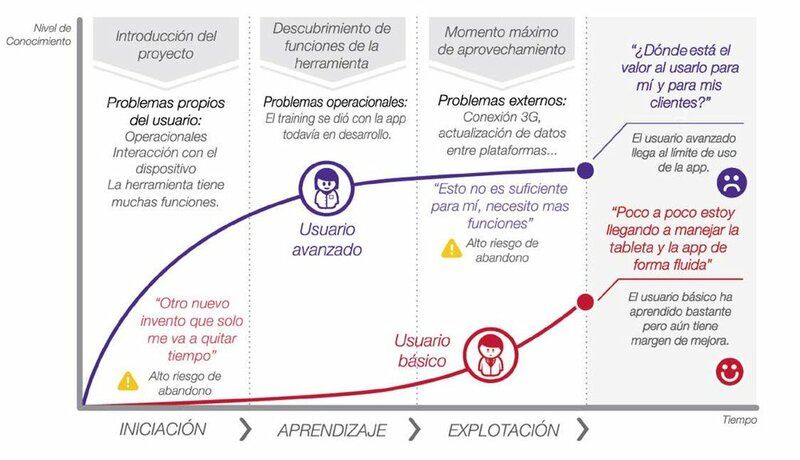 After our research we realized that the development of the app was just a small part of the system and the aligment with technology, training, commercial model, internal processes and communication was necessary to obtain the expected results. We developed a new UX/UI design of Advance gestion app, design an omnichannel strategy for mobility services and a set of actionable recommendations to connect the silos of the system. The final solution simplified the content of the app, selecting the critical features for the agents, prioritize the information focusing on improving the interaction with clients and adding real time simulations of new financial products. On the other hand, the omnichannel strategy took into account the complete range of actions of the agents during the day and select the most effective channel to perform them. Being in constant collaboration with agents give us the right perspective to shape the solution that satisfy their needs. Moreover, looking at the project with a holistic mindset helped us to uncover intertwined issues and identify the critical pain points of the experience. Although we created digital mock ups to gather the reaction of the agents, we could have defined a set of metrics to measure the impact of our solution during the pilot. Unfortunately, it was not included in the scope of the project.